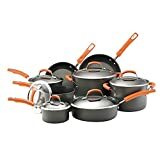 Best Hard-Anodized Cookware Sets of 2019 | Top 5 Rated and Reviewed. The more you research cookware, the more you realise how vast the market is. There are so many brands, collections, ranges, materials, eco-friendly options and aesthetics out there. When looking for a new cookware set, it’s understandably frustrating when you find a whole bunch of products with technical names you don’t really recognize. You just want to know, “what is this? What’s it made of and will it serve me well?!”. Today we’re tackling one very common cookware material…hard-anodized aluminum. We’ll find out what exactly it is, what benefits it offers, and then we’ll reveal the top five best hard-anodized cookware sets. Calphalon is a well-known, trusted brand in the cookware world. This particular set is from their “Simply” range and it has thousands of reviews…most of them 5-star. What’s evident with this set is that it offers great value for money. The price is very low, considering you get six cookware items (plus four lids). The cost per item and cost per use is rather miniscule when you think about it. You get: 8-inch and 10-inch omelet pans, 1-quart saucepan with lid, 2-quart saucepan with lid, 3-quart saute pan with lid and a 6-quart stockpot with lid. There’s really nothing missing here, you can satisfy your entire cookware requirements with this one set. It’s an attractive set, with a deep, inky charcoal outer and glass lids. Great for people who have a classic, classy taste and like to keep their cookware simple and sleek. 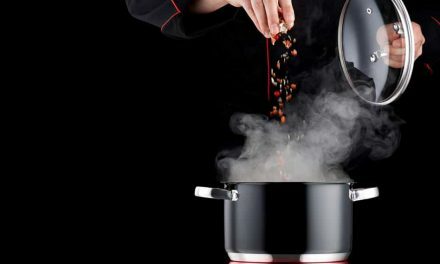 Calphalon's signature hard-anodized aluminum construction for excellent conductivity and even heating. The interior surface is double-coated with Calphalon's sturdy, reliable nonstick coating. The hard-anodized aluminum is coated with two layers of non-stick coating, which is PFOA-free. 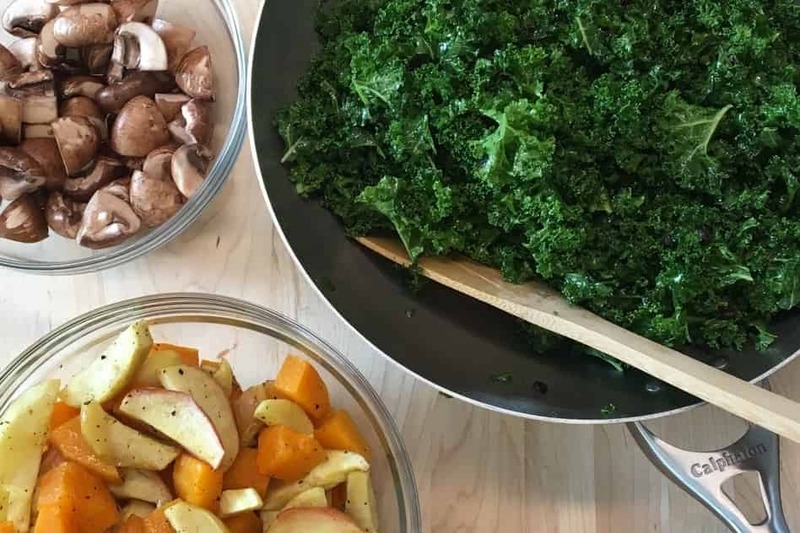 The reviews show an overwhelming consensus that the non-stick coating on these pots and pans is truly non-stick. Customers have raved that their eggs (everyone uses eggs as the prime example!) slide about with ease. This is great for people who are trying to cut down on fat in their diet as it completely cuts the need for adding extra oil and butter. We really like the handles, as they’ve been enhanced with silicone to remain cool and easy to get a steady grip. The lids are great too, made from tempered glass, shiny metal rims and silicone-coated handles. The only potential downside to this cookware set is that none of the items are dishwasher safe. However, this shouldn’t pose a problem as the non-stick surface makes them super easy to hand wash anyway. In fact, even cookware which is said to be dishwasher safe usually lasts longer when hand-washed most of the time anyway. This is an attractive and comprehensive cookware set with a great variety of shapes, sizes and uses. 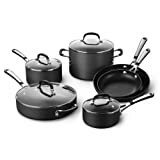 It’s ideal for people who have a low-medium budget but need a full set to get them fully equipped for all kinds of cooking. We love that everything is oven-safe so you can easily switch between stove and oven without changing vessel. We recommend this set to anyone who either doesn’t have a dishwasher or prefers to hand wash their cookware. Great for people who want a non-stick range which actually stands up to the claim. Next we have a large cookware set from Rachael Ray. This set includes 8 items (plus 6 lids). You get: 1-quart, 2-quart, 3-quart and 4-quart saucepans with lids, 6-quart stockpot with lid, 3-quart saute pan with lid, 8.5-inch and 10-inch skillets. The cost of this set (without a discount or on sale) is pretty high at first glance. However, when you consider how much you get and the versatility of the cookware, it’s actually pretty great. Every piece made from hard-anodized aluminum with an effective non-stick coating. This set is dishwasher safe and oven-safe (up to 350 degrees Fahrenheit). We love this because it increases the ease-of-use and makes for a multi-tasking cookware set. You can slow-cook meats and casseroles in the oven once you’ve browned the meat on the stove, without messing up two cookware items. The handles have a rubberized cover on them which makes them very easy to grip confidently. It also adds a cool pop of color as the handles are bright orange to contrast the charcoal body. The lids are really well designed, with tempered glass and a tight-fitting shape. This means you can see the food as it cooks, while still keeping that moisture and heat locked in tight. The reviews (of which there are many) are strongly weighted in the 4 and 5-star sections. The most common comments are that this cookware is really easy to clean, truly non-stick, heats evenly and doesn’t mark or fade. We give this cookware set two thumbs up. The hard-anodized aluminum base and non-stick surface have proven to be effective according to many happy reviews. The range of cookware items is great, with no gaps left to be filled. We think this would be a great gift for a first-home owner, a young couple or someone who needs a complete set of versatile and high-quality cookware. 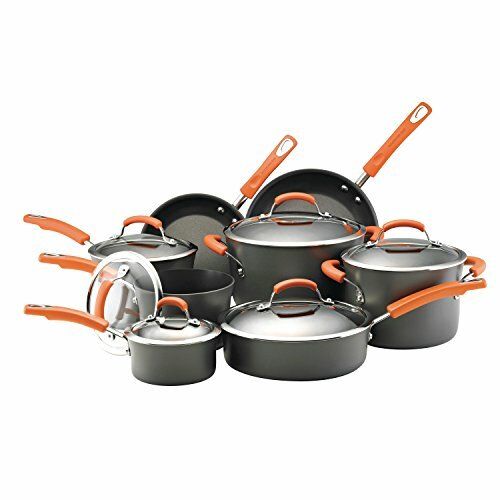 Here we have a 10-piece cookware set made from hard-anodized aluminum with a non-stick coating. You get: 2 skillets (different sizes), 1 large stockpot with lid, 1 saute pan with lid, 2 saucepans (different sizes) with lids. The price is reasonable, considering that you get a comprehensive cookware set with everything you need. 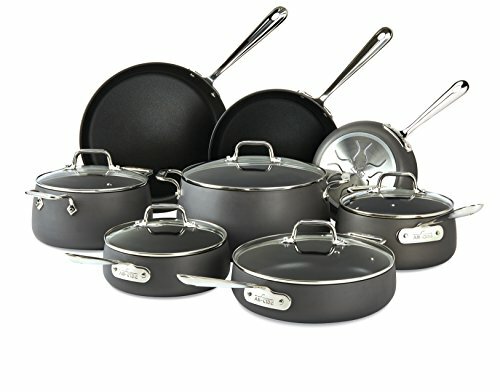 Do keep in mind that some brands will charge the cost of this whole set for one pan, just to put things in perspective. These pots and pans have Circulon’s own TOTAL(r) Nonstick System. This is characterized by lots of raised concentric circles. These help the food to be easily released from the surface, helped even further by the 3 layers of non-stick coating. The concentric circles help the surface to be compatible with metal utensils without risk of scratching and chipping. You’ll see that the bottom of these pots and pans are made of a shiny, silver metal. This is stainless steel which has been “impact-bonded” to make it suitable for induction cooktops. Circulon claims that their non-stick coating lasts “10 times longer than ordinary nonstick”. We really like the handles on these pots and pans. The base is made of stainless steel, and they’re coated with rubber to keep them cooler, and provide a sturdy grip even when wet or greasy. We love the tempered glass lids too, with a tight fit and rubberized stainless-steel handles for a comfortable grip. We give this hard-anodized cookware set from Circulon a big nod of approval. We think it would be a great choice for anyone in need of a complete cookware overhaul. Ideal for people with induction cooktops and a habit of using the oven and dishwasher with their cookware. 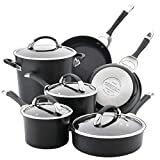 This set has a few extra little features such as the TOTAL(r) Nonstick System, stainless steel base and rubberized handles which nudges it up in the quality ranks. T-Fal is an extremely well-known brand. They’re characterized by their special red spot (Thermo-spot) in the center which glows when the pan is sufficiently heated. We’ve chosen this hard-anodized cookware set because it’s incredibly affordable considering everything you get with it. It comes with: 8-inch and 10.25-inch fry pans, 11.5-inch fry pan with lid, 10.25-inch square griddle pan, 1-quart, 2-quart and 3-quart saucepans with lids, 3.5-quart saute pan, 5-quart Dutch oven with lid. 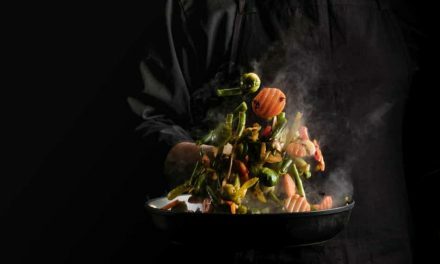 They are, of course, made from hard-anodized aluminum with a PFOA-free non-stick coating. Despite the very low price, these pots and pans are extremely versatile and user-friendly. They can be thrown into the dishwasher for a fuss-free wash. They’re oven safe so you can switch from stove to oven without switching cookware. The exterior is super hardy (thanks to that hard-anodized aluminum) and is scratch-resistant and safe for metal utensils. Of course, they have the Thermo-spot heat indicator to let you know when they are hot and ready to go. This is helpful for newer home cooks, as it stops you from adding food to a pan which isn’t quite ready. This can affect the flavor and overall end result. The handles (on the pots, pans and lids) are coated with a silicone layer to stop them from getting painfully hot. It also makes them easier to grip and transport firmly. Some cheaper cookware can be prone to warping which completely ruins the effectiveness. This set has been created with T-Fal’s TechnoResist Anti-Warp base which stops them from getting that annoying uneven surface after a while. And as a little extra bonus, the set comes with a slotted spatula and large spoon made from durable nylon. This has to be the ultimate cookware set for very limited budgets. We think this is a perfect set for students, young couples or “first-time living away from home” cooks. Do take note that it’s not induction-compatible, but it’s great for all other cooktops and ovens. You get a great variety of cookware, with no missing items a regular home cook would need. Great durability, user-friendly features and attractive design for all kitchens. This is the most expensive set in our list, but it does offer the fantastic quality associated with All-Clad cookware. The hard-anodized construction is coated with a non-stick surface which is scratch-resistant and durable. The deep charcoal exterior is beautifully offset with shiny, stainless-steel handles and lid handles. However, the handles aren’t coated with rubber or silicone, so they might get a little hotter than other cookware handles. You get: 8-inch, 10-inch and 12-inch frying pans, 2.5-quart and 3.5-quart saucepans with lids, 4-quart saute pan with lid, 4-quart soup pot with lid, and an 8-quart stockpot with lid. The lids are made from tempered glass for a see-through finish and a very snug fit. When looking at the bottom of the cookware, you’ll see that it’s made of a shiny silver. This is because the bottoms are made from a bonded stainless steel. This is to make them completely resistant to warping and makes them induction compatible. You can pop these pots and pans into the oven up to 500 degrees (not the lids), which is fantastic for versatile cooking. It really makes a difference to be able to saute on the stove then finish off a dish in the oven, or even slow-cook in the oven from the start. They’re also dishwasher safe, which comes in handy when you’re too tired to stand at the sink scrubbing and drying. This is a serious cookware set for serious home cooks with a generous budget. 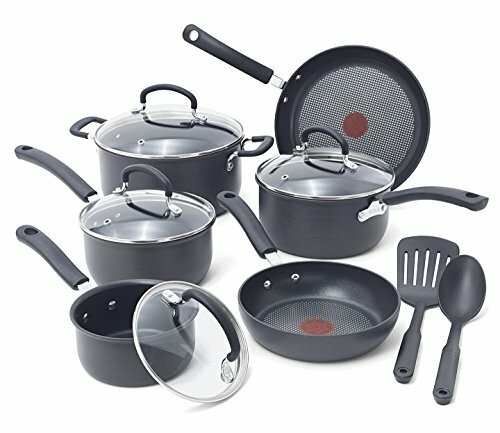 These pots and pans have a unique shape with curved, slightly flared bottoms and a lightly brushed, dark-charcoal exterior. They have a few extra features to answer for the price, such as bonded stainless steel bottoms for an anti-warp, induction-friendly experience. They offer dishwasher-safe and oven-safe user-friendliness and a very durable, non-stick surface. You get everything you need with this high-quality, highly-rated set. When you read “hard-anodized” in a cookware context, it’s referring to aluminum which has been treated. The purpose of the treatment is to create a thicker layer of oxide on the surface of the aluminum. Aluminum oxidizes naturally anyway, so the anodization process just speeds it up and makes it extra oxidized. The surface is then extremely hard, non-stick and durable against scratching and marking. One of the main reasons why we don’t simply use untreated aluminum is because it can be harmful if it leaches into our food. The process of anodizing is quite complicated (if you’re not a science buff). It involves bathing the aluminum in an acidic bath, with electric currents being passed through it. This causes the surface of the aluminum to oxidize which results in that hard, non-reactive, durable surface we love. Non-stick: the hard-anodizing process creates a reasonably non-stick surface. 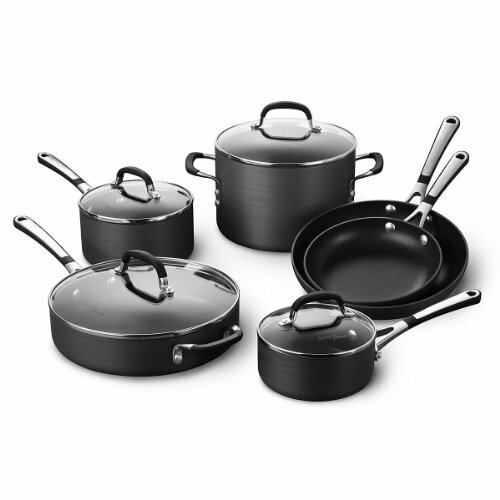 Most hard-anodized cookware sets have a non-stick coating added to ensure a true non-stick performance. Non-reactive: some metals, such as non-treated aluminum are reactive to acids. This means that foods such as tomatoes can cause the metal to leach into the food. Hard-anodizing creates an oxidized layer which is totally non-reactive, protecting your food from nasty metal contamination. Scratch-resistant: the hard-anodized surface is really hardy and stands up to scratches and scrapes. (Some hard-anodized cookware sets do advise against using metal utensils, but that’s mostly due to the added non-stick coating). Hard-wearing: it’s called hard-anodized for a reason, it’s durable and strong against wear and tear. Even heat distribution: hard-anodized aluminum is a fantastic conductor of heat, better than stainless steel. It grabs the heat efficiently, and distributes it evenly across the cookware. This is crucial for evenly-cooked food without those annoying overcooked patches due to “hot spots”. As we can now clearly see, hard-anodized aluminum cookware is durable, resilient, non-stick and almost always oven and dishwasher-friendly. All five of these cookware sets are very similar in terms of what the offer to the user. They’re all comprehensive and offer everything a home cook would need for a wide range of cooking tasks. All five cookware sets come with snug-fitting, durable lids and most of them feature enhanced handles for cool-touch, secure handling. If you have an induction cooktop, consider the All-Clad and Circulon sets as they’re safe for all cooktops. The cheapest set here is the T-Fal set, with the most expensive being the All-Clad set if you’re budget can stretch to this high-quality set. When it comes to cleaning your hard-anodized aluminum cookware sets, it is best to hand wash when possible. 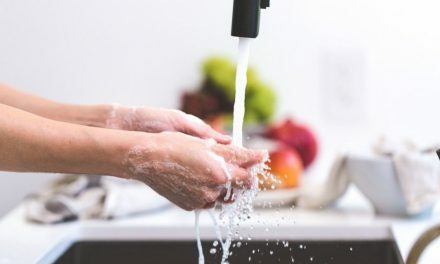 Even if the set does state that it is dishwasher-safe, it’s generally best to go for hand washing just to be sure. This can help to care for the longevity of the set. Make sure to use soft washing brushes and utensils, just to safeguard against scratching the non-stick surface. When choosing which one to get, take a look at what each set offers you, the particular features and user benefits, and match it to your needs. 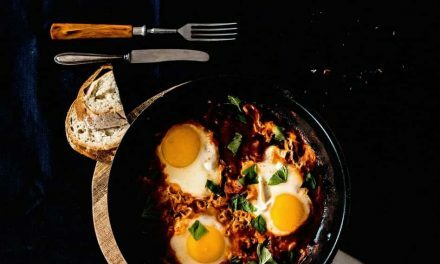 We’re completely confident in each and every hard-anodized cookware set in this list, and we know there’s a perfect match for you!